Here is what the German magazine Fono Forum wrote about his recent DVD recording of the last Beethoven sonatas: "Jerome Rose belongs to the legendary pianists of our times. Rose, who studied with Adolph Baller and worked with Leonard Shure and Rudolf Serkin, fascinates with the enormous concentration of his playing... The ease of his playing transmits a thorough unity between interpreter and music. Accordingly he succeeds in performing the three last Beethoven sonatas with chiseled grandness and emotional intensity." While International Piano praised his "tantalising combination of interpretative warmth and structural directness is at its most revelatory in the late Beethoven sonatas". Adding that "The Prestissimo of op. 109 and Allegro molto of op. 110 possess a no-nonsense, Pollini-like rigour, yet are the polar-opposite of the Italian's essentially vertical attack. Rose's cantabile touch really comes into its own in the op. 111 Sonata, which exchanges Barenboim's high-tensile fire-and-drive for an epic grandeur that ensures the opening movements restless thrusting never becomes merely oppressive." 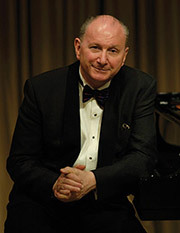 A founder and director of the International Keyboard Festival held annually in New York City, Rose has appeared in recital on top stages around the world and has been soloist with most major orchestras such as Berlin Philharmonic, Munich Philharmonic, Vienna Symphony, Santa Cecilia, London Philharmonic, London Symphony, Royal Philharmonic, Chicago Symphony, San Francisco Symphony, Houston, Baltimore and Atlanta, conducted by Sir Georg Solti, Wolfgang Sawallisch, Sir Charles Mackerras, Stanislaw Skrowaczewski, Sergiu Comissiona, David Zinman, Hans Vonk, Robert Spano, and Christian Thielemann. He was a pupil of Adolph Baller when, at the age of 15, he debuted with the San Francisco Symphony. A graduate of the Mannes College and the Juilliard School of Music, Jerome Rose studied with Leonard Shure and Rudolf Serkin at Marlboro. In 1961 he was a Gold Medalist from the International Busoni Competition, a winner of the Concert Artists Guild award and was also a Fulbright Scholar in Vienna. His catalogue of critically acclaimed recordings on Medici Classics includes the Liszt Concerti with the Budapest Philharmonic, Liszt's Transcendental Etudes, the Complete Schumann Sonatas, "Davidsbundlertanze", and "Kreisleriana", the Last Three Beethoven Sonatas, the Complete Ballades & Fantasy of Chopin, the Schubert Posthumous Sonatas and Wanderer Fantasie; a Liszt album featuring the B minor Sonata, Don Juan Fantasy and Mephisto Waltz; and a Brahms recording of Sonata No. 3, and the Variations and Fugue on a Theme by Handel. The complete Chopin Sonatas are released on Sony. Medici has also issued the re-release of Mr. Rose's Prix du Disque recording of Liszt's "Years of Pilgrimage". In addition Medici has released Mr. Rose's first DVD recordings, already highly acclaimed by the international press: The Four Ballades and Sonatas No. 2 and 3 of Chopin; the Sonatas of Beethoven, Opp. 101, 109, 110, and 111; an all-Schumann DVD: Humoreske, Fantasie, and Carnaval; and an all-Liszt DVD recording including the Sonata, Bénédiction, Funérailles, Petrarch Sonnets, and Vallée d’Obermann; and an all-Schubert DVD of the Last Four Sonatas. An all-Brahms recording of Sonata No. 3, Klavierstücke, Rhapsodies, Fantasies and Intermezzi, and an all-Schumann recording of Kreisleriana and Davidsbündlertänze were recently released on DVD and Blu-ray. Mr. Rose has given masterclasses at the Moscow Conservatory, the Chopin Academy in Warsaw, the Mozarteum in Salzburg, the Munich Hochschule, and the Toho Conservatory of Music in Tokyo, Japan. He is on the Faculty of the Mannes College of Music and is Founder/Director of the International Keyboard Institute & Festival held every summer in New York City. Mr. Rose's performances at the Festival have been recorded by WFMT Chicago and NPR for worldwide radio broadcast. He is also in demand as a juror at international competitions including the E-Competition (USA), Beethoven (Germany), Liszt (Netherlands), Hamamatsu (Japan), and Chopin (Poland) Competitions. He has toured major cities in China, giving recitals, masterclasses and promoting his 4 volume book "Becoming a Virtuoso". Last season included masterclass and recital appearances in the US, Korea, and Europe. This season includes classes and recitals in the US, Europe, China, Korea, Taiwan and Japan. Mr. Rose was awarded an Honorary Doctorate in Music from the State University of New York for his lifetime achievement in music.